Cannot have multiple fonts, sizes, or graphics in your return address. Cannot save addresses automatically to your address book, like you could in version 6.1. Cannot print envelopes with a single click, bypassing the dialog box. Cannot find addresses automatically in columns or tables. [NOTE: I've uploaded what the current dialog looks like. I need to do some fiddling to see if I can get it to access the WordPerfect X3 Address Book, which I do not use.] 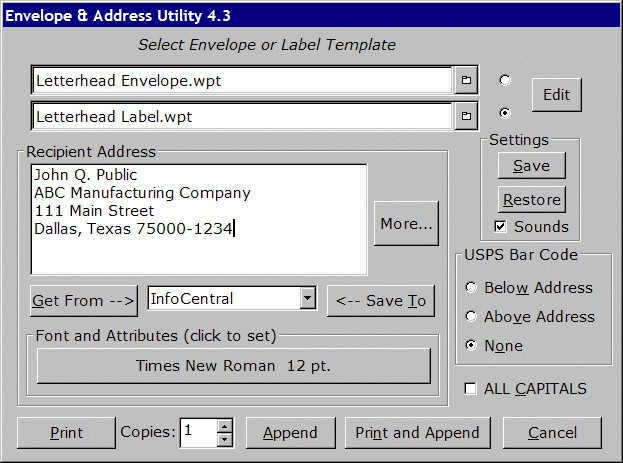 It allows you to set up one or more custom envelope templates, including the custom fonts, graphics, spacing, whatever you want, and uses the template to generate the envelope. In addition, for those using InfoCentral, the dialog will import addresses from InfoCentral or the Address Book, and export addresses to either one (including telephone numbers and e-mail address), meaning it will work as an import/export utility. The utility comes with a mini-manual ("Envelope.wpd") with instructions on how to use it (it's actually really simple), including a hyperlinked Table of Contents.